now grace the earth with their celestial beauty. 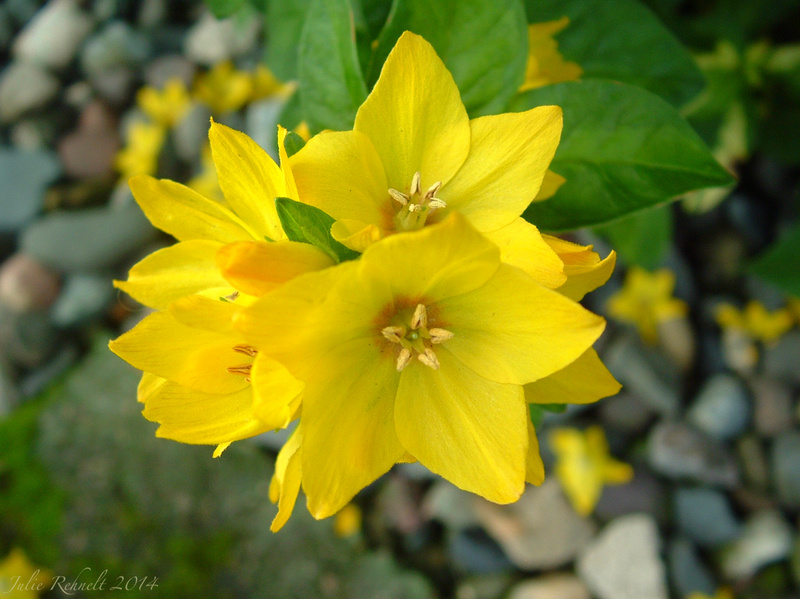 The Yellow Loosestrife has been at its peak here for the past several days and it’s absolutely gorgeous! In bright golden yellow, with its tall flowering stalks, that are covered with masses of little individually star shaped blossoms, it’s just so stunning! We had a heavy rain and some strong winds come through a few days ago that knocked quite a few of those blossoms onto the ground. Unfortunate, but it made for a lovely display of fallen stars on the ground, and there are still plenty of them on the stalks to enjoy. This entry was posted in Nature, Photography, Poetry and tagged Gardening, Nature, Photography, Poetry. Bookmark the permalink. 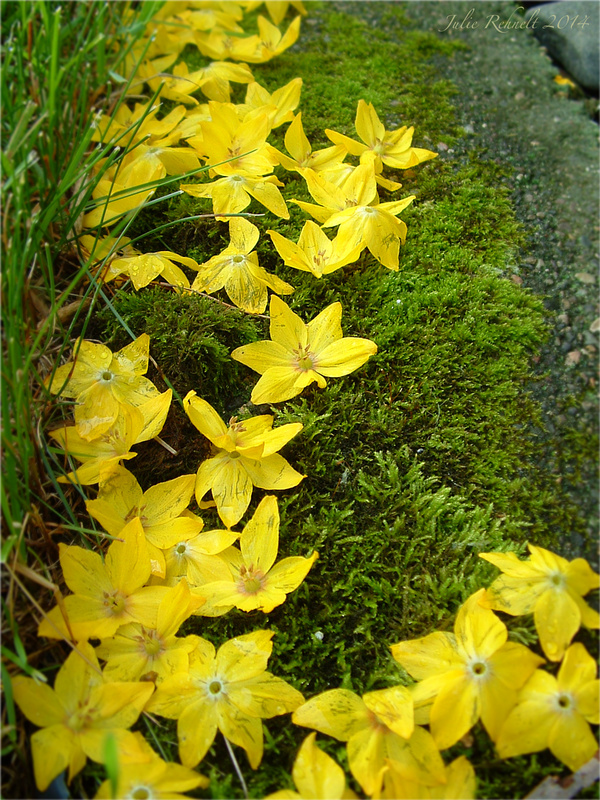 Lovely photos – the flowers really do look like fallen stars – and a wonderful poem. Beautiful! Thanks Amy, hope you have a beautiful day! 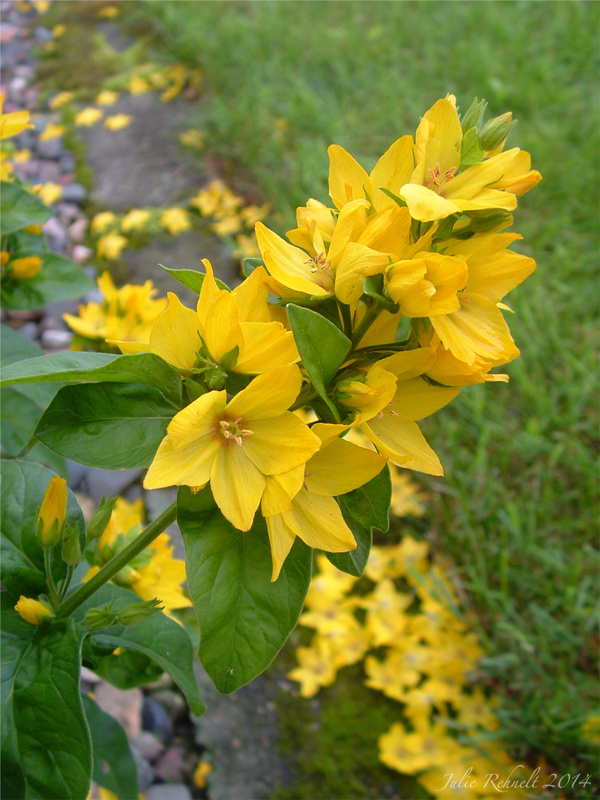 Oh gosh yes… I know all about the Loosestrife’s loose habits. 😉 I’ve been yanking it out left and right as it spreads to unwanted areas. It’s a very persistent plant though and it’s been a bit of a ‘loose-ing’ battle, so I’m probably going to need to move it somewhere else eventually, but it really is so pretty! Agreed – It can be a loose-ing battle sometimes! Julie, such a delightful little poem to accompany these precious gifts of nature. Yes, they look exactly like stars fallen from the sky. Lovely. Fallen stars, how appropriate. The photos are wonderful, I love how you used the elements in the photo to make your subject pop. Lovely photos, lovely way to look at them! So that’s what those yellow flowers are! There are some on one of our nature trails but I didn’t know what they were. I must say, yours are much prettier, even as fallen stars!